Screenshot: Can You Control A Person With Electricity? Remember QWOP, Bennett Foddy’s infamous browser game that has players trying to manipulate the legs of the world’s least coordinator runner? It’s something of a cult classic now, having inspired dozens of purposefully awkward games and at least one instance of incredible cosplay that became a meme of its own. But dressing and flopping around like QWOP is one thing. What if you could actually take control of your friend’s body and play some real-life QWOP? That’s the question James Hobson, an engineer and star of the YouTube channel The Hacksmith, set out to answer in a recent video. Turns out, yes, you can, and all it takes is a little scientific know-how and a friend who’s willing to be electrocuted for your entertainment. Having previously emulated much more complicated pop culture tech like Iron Man’s jet boosters, the QWOP challenge was a pretty simple one. Hobson and his team took inspiration from electroshock therapy. 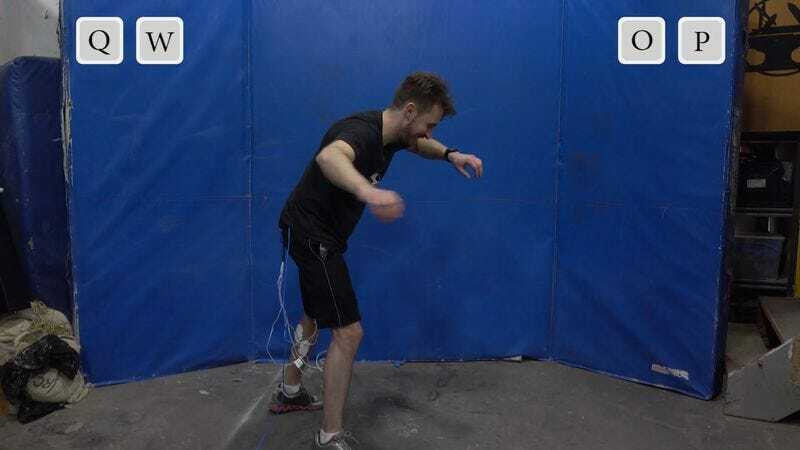 They modified some of the equipment used in that process and wired it to a keyboard so the “player” could press the Q, W, O, and P keys to send a gentle shock to the “runner” that would manipulate part of their leg. It worked out about as well as a real game of QWOP does—a whole lot of flailing and falling down while everyone watching laughs at QWOP’s misfortune.